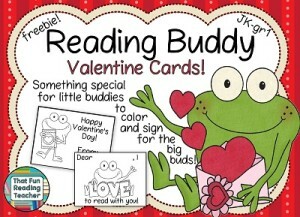 Home » GRADE LEVELS » 1st Grade » Read and Write and DIFFERENTIATE by printing – for Valentine’s Day! 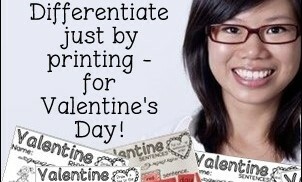 Read and Write and DIFFERENTIATE by printing – for Valentine’s Day! A significant part of my support role to kindergarten and primary teachers in recent years has been to provide instruction and / or resources to differentiate instruction for little people in literacy. Within one class, the range of abilities can span four grades. A little one’s tolerance to frustration towards a task that is too difficult, or another’s need for something to challenge his or her learning for just the right amount of time, can be a tough order to fill – especially at the same time – after gym and snack time and before recess, library and reading buddies. I have designed my Read and Write and More packages to allow teachers to #DifferentiateByPrinting. There are always activities in each of these products to address a variety of needs. 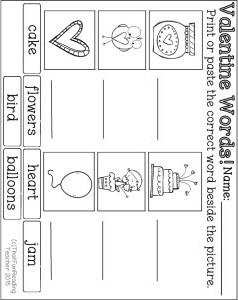 (Note: The colored sentence strips shown in the first example are provided in the Valentine’s Day Read and Write and More set. There are two different sentence options to choose from to photocopy onto each color paper, with six identical scrambled sentences on each strip). Having the option to place and paste sentence strips, place and copy sentence strips, work without the strips on easier or more challenging sentences, means that many pre-writers, early writers and / or are independent writers have an accessible starting point. See it, hear it, read it? Assessment or fun practice activities? I use the following pages for fun small group review, then send them home for the fridge, where my wish is for the back-of-the-cereal box effect. When I am doing the following rhyme activity with students, I am mindful of my data. 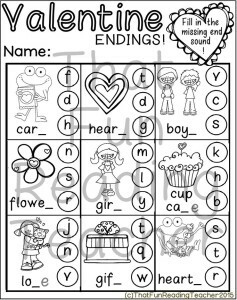 Those who need more practice listening for rhyme and ending sounds and who automatically compare letter patterns at the ends of words will get the sheet without print. Proficient rhymers who need more practice with looking closely at print will get the copy with the words. And, of course, other days there will be other activities for those who do not fit neatly into those categories. 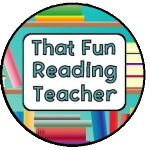 Follow That Fun Reading Teacher’s board Rhyme Time! on Pinterest. 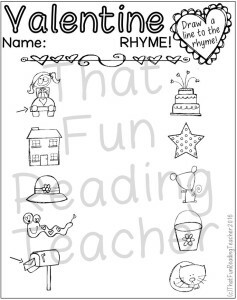 …activities for the 100th day of school! 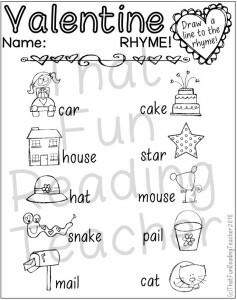 The Read and Write and More sets always contain three-part graphic organizers, thematic writing paper, and fun, literacy activities with an explanation page, ideas and options to help make activities accessible to a wide range of kindergarten to grade 2 students. We all remember our little students on Valentine’s Day. Check out the freebies below to be sure no one is missed! Happy Valentine’s Week, my friends!